The spindle drive of a disk drive showed a noticeable noisy behavior. Indications showed that this is triggered by electromagnetic excitation. 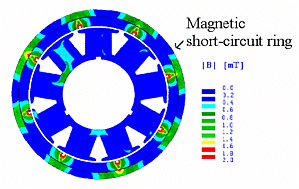 The spindle motor’s rotor carries a magnet in the form of a ring with 8 changing polarities (top figure). A magnetic short circuit ring bounds off the magnetic field at the outer edge. The stator comprises of a lamination stack (green) and the electric windings (red). 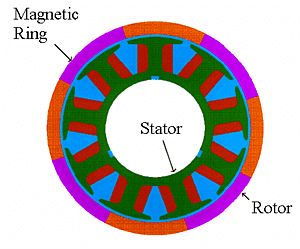 The stator is glued to a non-rotating shaft on the inside. The 9 stator coils are connected to operate electrically like 3 coils. The magnetic field of the rotor closes depending on the position of the rotor over the stator (middle figure). During rotation of the rotor, a displacement of the magnetic field leads to interaction forces between the stator and the rotor. The tangential components of these forces represent the motor drive. The radial components, which also exist can cause mechanical vibrations and therefore, also noises. In regards to the spindle’s rotational speed, these vibrations occur in multiples of the excitation order 8 (number of poles). 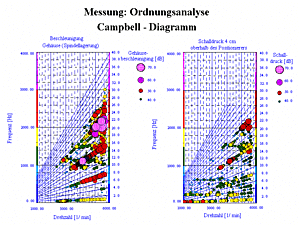 These excitation orders can be clearly seen in the Campbell diagram (bottom figure). The left diagram shows the excitation orders for the structure borne sound and the right diagram shows the excitation orders for the air borne noise. The 24th excitation order (3x8) meets mode shapes of the structure at the stationary operating rotational speed at 5400 [min-1] and excites this resonantly. The excitation of these resonances occurs by interactions of the first bending mode shape of the stator shaft with mode shapes of the housing. These vibrations could be avoided by defining a specific order for screwing the housing and by decoupling the stator and stator shaft.